The Economic Partnership Agreement between the European Union and the ECOWAS states of West Africa envisages co-operation between the two sides with the aim of enhancing investment and private sector development in the ECOWAS region. 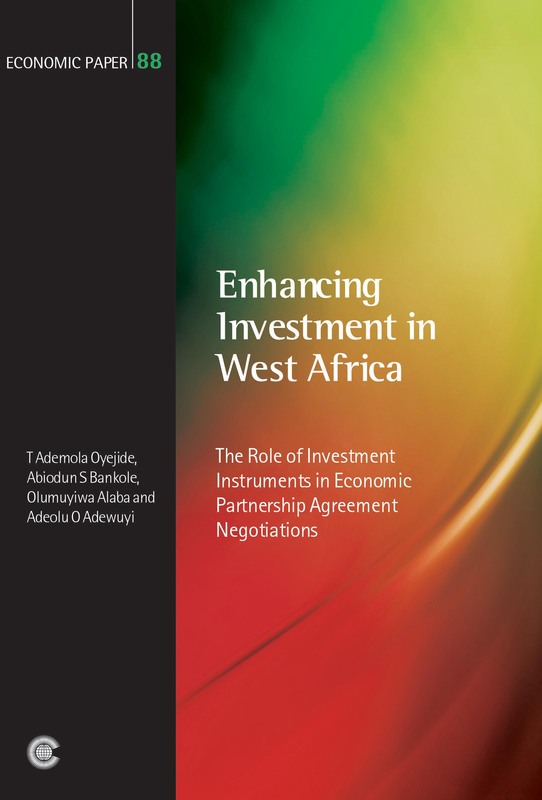 This study explores the options available to ECOWAS states for promoting, protecting and guaranteeing flows of domestic and foreign direct investment, in the context of the ACP-EU Economic Partnership Agreements, so that development gains are realised in these economies. 5.5 Does European Investment Bank funding ‘crowd out’ local resources? 6.4 What are the investment provisions of the interim EPA texts of Ghana and Côte d’Ivoire? Professor T Ademola Oyejide is a Professor of Economics at the Department of Economics of the University of Ibadan, and Executive Director of its Trade Policy Research and Training Programme (TPRTP). Dr Abiodun Bankole is a senior lecturer in the Department of Economics of the University of Ibadan, and a senior research fellow at its Trade Policy Research and Training Programme (TPRTP). Dr Olumuyiwa Alaba is a senior lecturer in the Department of Economics of the Lead City University, Ibadan, and a senior research fellow at its Trade Policy Research and Training Programme (TPRTP). Dr Adeolu O Adewuyi is a lecturer in the Department of Economics of the University of Ibadan, and a senior research fellow at its Trade Policy Research and Training Programme (TPRTP).